Problem: I have two conduits which are supposed to connect but do not, because there was a slight gap between the ends of the geometry I used for creating the models. 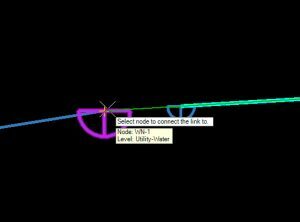 How can I join the two conduits without creating a new node. You may find yourself with something similar to the following image. Two conduits which almost but do not quite join. You desire for them to exactly connect. The solution is pretty simple. In the plan view, select one of the conduits. 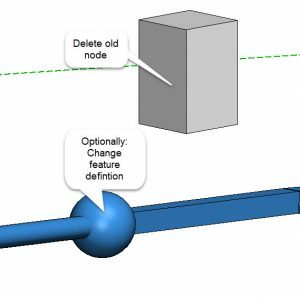 Click on the first drag handle and then reconnect the conduit to the node on the end of the other conduit. The conduits will now connect because they share the conduit on the end. Delete the old leftover node. In this example, the 3D presentation of the node changed shape because the software cannot make a “connector” which also changes shape. Thus, you will see a ball shaped node in 3D. If the two conduits were the same shape then the 3D would be generated to look like a connector/reducer. You can then change the feature definition of the shared node to look like something more appropriate. 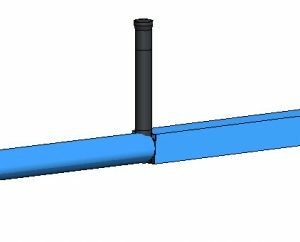 In this case, I used a water valve feature definition. 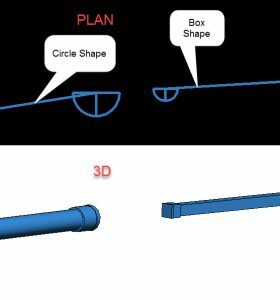 Alternatively, you could create a special feature definition for such purposes which shows almost nothing in plan or 3D. For example, you could show a small circle in plan and a tiny dot in 3D.